Kabuki is a traditional Japanese dance-drama known for its stylised take of performance and the elaborate make-up worn by some performers. It is a very old art form, which had its golden age in the late 17th and early 18th centuries. Today it is the most popular style of traditional Japanese drama and its star actors can be seen in television and film roles as well as on the stage. While there are many wonderful places in Japan to view Kabuki theatre, the Kyoto Minamiza Theatre is one of the principal venues for such performances and a major hub for the art form. The building itself is an architectural wonder, built in a traditional style in 1929, on the edge of the Geisha district of Gion. 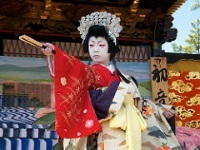 Visitors can pay to see individual acts of plays or to see the entire performance. Because the theatre has become popular among tourists, an English voice-over or purchasable programme explains the show to foreigners. A trip to the theatre is a fascinating cultural experience and shouldn't be missed by any tourists with an interest in theatre and Japanese culture. For the uninitiated, one act is generally enough. It is often best to begin with an individual act and then book for a full performance if you enjoy it.